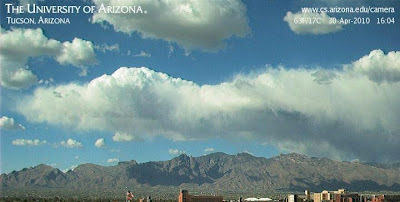 The very cold, middle-level air and some daytime heating have produced light showers and virga over portions of southeastern Arizona, primarily over higher elevations. These heavy cumulus over the Catalina Mountains at 4 pm this afternoon are icing out at very low levels in response to the very cold 500 mb trough overhead! A deep 500 mb trough coves the western half of the US this morning - see top image - and is bringing unseasonally cool temps to much of the country. Here at the house the morning low on this last day of April was 38F. Precipitation with this feature is mostly out in the Plains and eastward. Today's outlook from the SPC (bottom image) indicates a forecast of a slight risk of severe thunderstorms over almost all of the Mississippi Valley. Since the explosion of the oil rig in the Gulf of Mexico, on April 21st, there were a couple of days of strong southerly winds followed by westerly, northwesterly, and then light and variable winds. 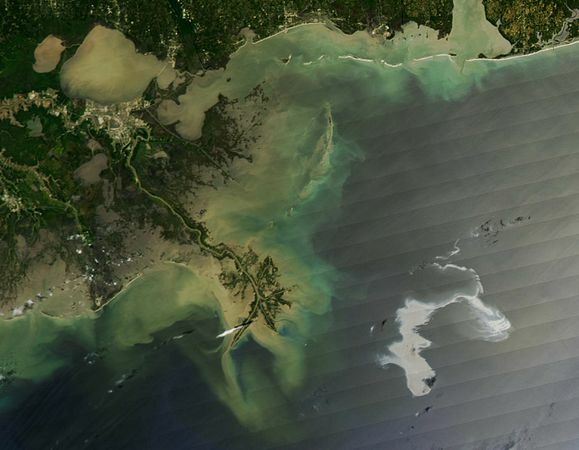 This wind setting, along with currents, has led to the current configuration of the spill (silvery smear southeast of the mouth of the Mississippi in top image). The current 500 mb short-wave over the West is forecast to stagnate, as well as deepen, more or less covering the western third of the US. The NAM forecasts an extended period of strong, low-level southerly flow with a fetch from over the Caribbean Sea (see bottom image for 850 mb forecast valid Friday morning). So it appears that the battle against the spill plume will have to intensify, if it is to be kept offshore. The SSTs over the Gulf are still a degree or two below normal; whereas, SSTs over the Caribbean are a degree or two warmer than normal. The long fetch from lower latitudes forecast by the models will set the stage for a number of days of renewed severe thunderstorm activity over the central half of the US. See the SPC Convective outlooks. There is an article in the NY Times about the use of Power Point Presentations in our military. 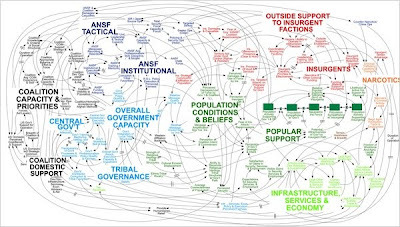 It is quite interesting, almost amazing, except that I spent 8 years in USAF and can easily see how this all happened! I'm sure most everyone is aware, by now, of the deadly tornado outbreak that occurred Saturday April 24th east of the Mississippi and south of the Ohio Rivers. We've been away over the weekend and I have just taken a look at the charts for this event; I can't resist commenting. While the general setting and likelihood of a significant severe thunderstorm outbreak was synoptically evident, as was mentioned on the MAPS talk board, there were many complicating factors. The situation had been characterized by widespread nighttime and early morning thunderstorms, bow echoes, and small storm complexes before the Storm Prediction Center's (SPC) 1200 UTC morning outlook was issued (top). There were many mesoscale and storm-scale features (outflows, debris clouds, old anvils, etc.) that could have disrupted, or modified, the intense large-scale setting. The long-lived, supercell thunderstorm that produced the tornado that struck Yazoo City, Mississippi, appeared to develop around 13 UTC in western Louisiana and then moved rapidly east-northeastward at around 60+ mph. The preliminary severe storm and tornado reports are shown in the bottom graphic, which clearly indicates that there were apparently several long-lived, or cyclic, supercell thunderstorms producing very long damage paths. Note that the High and Moderate risk areas verified extremely well, with the Yazoo City storm tracking right through the center of the High Risk area. Kudos to the forecasters at the SPC! The final short-wave trough with the large 500 mb cutoff has been producing rains over southeastern Arizona since about midnight. 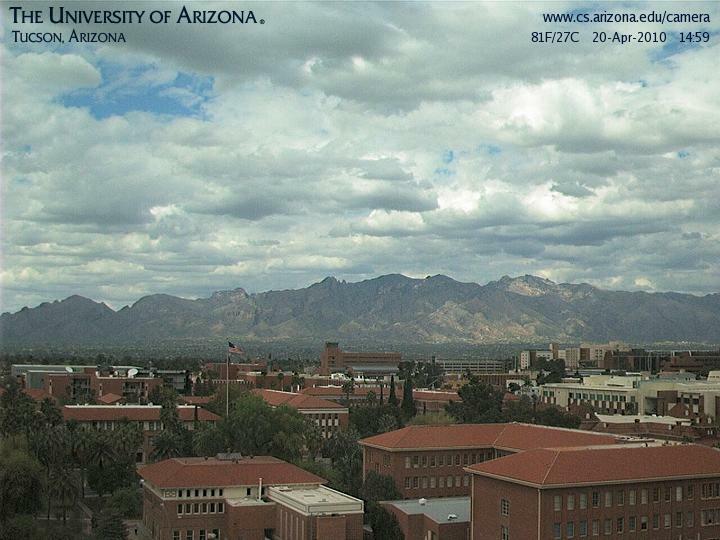 At sunrise this morning the mountains have a light covering of snow - Catalinas bottom image and Kitt Peak top. Looks and feelsquite like winter out there! The Pima County ALERT gauges indicate that almost 100% of the gauges had rainfall during past 24 hours. Amounts were light - mostly from a tenth to a quarter of an inch. Three sites had slightly more than half an inch and these were in the south part of the network. Most of that heavier rain was after midnight and the NAM forecasts last evening indicated heavier QPF toward the borderlands. Here at the house at 6 am the temperature was 43F and it was raining very lightly. Rainfall here was 0.08" with 0.02" of that occurring yesterday afternoon. There were some lightning strikes in northern Mexico yesterday, with the northern most strikes occurring along the border west of Nogales. So, this event has been interesting, but not very wet with a total so far of only a tenth of an inch here at the house. 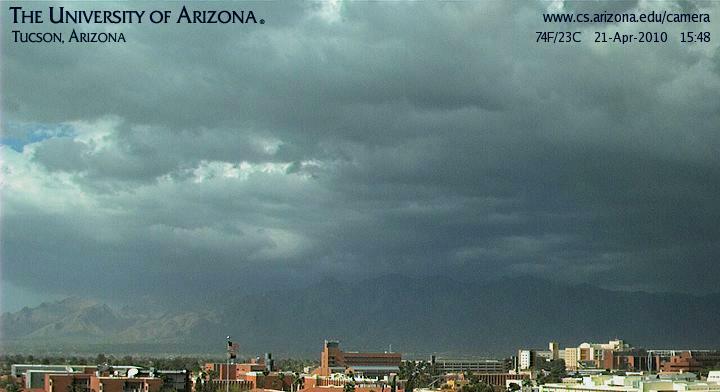 Tucson international airport recorded a record low high yesterday of 59F. 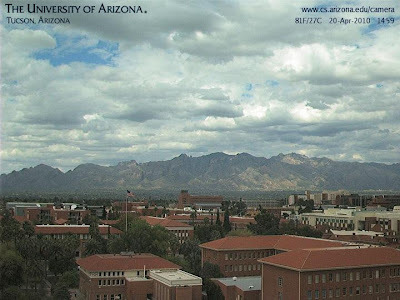 Pacific cold front passed through Tucson area yesterday afternoon between 3 and 4 pm MST and showers and thunderstorms developed along and behind the front - mostly over higher elevations. I didn't hear any thunder here at the house but noted there were quite a few lightning strikes to the east over the Rincons. We had 0.02" of rain showers around dark here at the house. Across the Pima County ALERT gauge network 40 of 93 stations measured rainfall - 7 stations at higher elevations had amounts just over half an inch. Winds gusted generally 30 to 40 mph ahead of and with the front. Highest gusts I found in southeast Arizona were: 62 mph at Gutherie RAWS, 59 mph at ATMO rooftop anemometer, and 52 mph at Empire RAWS. Was a chilly, clear sunrise here with a low at house of 36F. Second vorticity maxima at 500 mb will move rapdily east-northeastward during the day today from northern Baja toward New Mexico bootheel. Low-level winds are more westerly today and it's hard to come up with any CAPE in the Tucson sounding for this afternoon. However, substantial 700 mb moisture will pull across southeastern Arizona, bringing more showers, particularly in the mountains. Final vorticity maxima comes across southeastern Arizona late tonight and tomorrow morning, acording to NAM forecast from 12 UTC this morning. The NAM forecasts a final round of more substantial precipitation with this feature. Strong Pacific front with the 500 mb cutoff low has pushed into west-central Arizona this morning with rapdily falling temperatures and gusty surface winds. For example, Kingman's temperature has fallen steadily since 4 pm yesterday and had dropped 41 degrees F by 6 am this morning. The front was accompanied by gusts to around 40 mph and some light rain there. Winds ahead of the front are strong southerly and Tucson's morning sounding is flirting with having some CAPE - note the sounding is a bit dry wrt the GPS PW. The NAM forecast from 1200 UTC this morning does not forecast precipitation over southeastern Arizona during the next 24 hours. However, the model indicates a strong frontal passage this afternoon (see 850 mb forecast above) along with very strong positive vorticity advection at 500 mb (bottom image). Thus, it appears likely that the front may produce some showers and thunderstorms along with the gusty dusty surface winds. Should be an interesting afternoon and evening. Two more vorticity maxima are forecast to swing around the 500 mb cutoff before it moves away from Arizona. The NAM forecasts anywhere from 1/10 to 1/2 an inch of precipitation with the system after 1200 UTC tomorrow morning. Both the GFS and NAM models, from 12 UTC runs this morning, forecast very large height falls at 500 mb as the Pacific S/W cuts off over the Southwest tomorrow. Tucson had a 500 mb height of 576 dm this morning and both models forecast steadily decreasing heights down to about 552 dm by Thursday afternoon - an impressive fall of around 240 m. Will definitely not feel like summer during rest of week. The two images above show predicted 60-hour precipitation ending at 5 pm Friday afternoon - NAM top and GFS operational member bottom. Neither model predicts much rainfall over southern Arizona, with amounts from less than a tenth of an inch to around a quarter of an inch. However each model predicts several strong vorticity maxima rotating around the cutoff, so the details of how rainfall evolves will be interesting. With strong forcing for vertical motion and dramatically cooler midlevel temperatures, the chances for thunderstorms over southeast Arizona appear quite good. Some rainfall would be quite welcome, since the last rain here at house was on March 23rd. April has brought mostly wind and dust, with trace rainfall from sprinkles and spits on just two days. We have returned from a long trip to Washington D.C., where we did see a bit of rain last Friday. Here in the Southwest it almost looks like "Play it again Sam" with another strong, 500 mb shortwave trough digging south off the California coast. Ahead of this system precipitable water has been slowly increasing during the past several days. 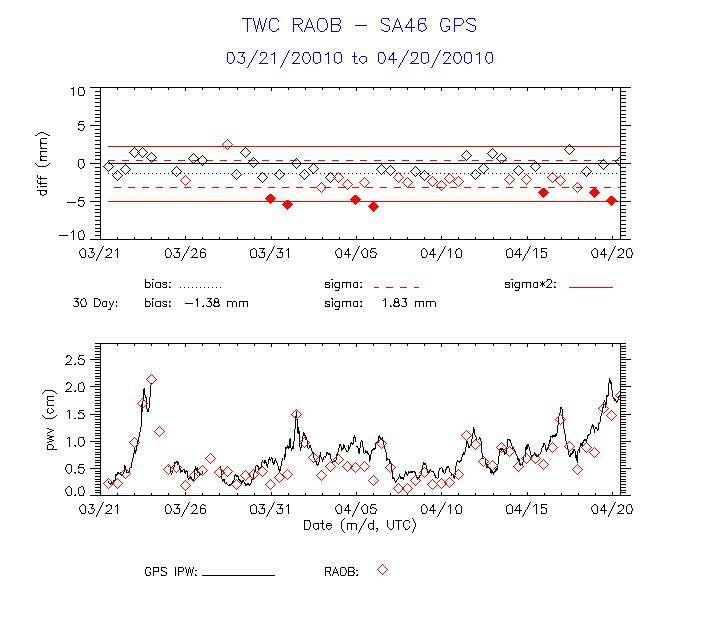 The view looking north to the Catalinas (top) shows a heavy Cu field and the bottom two graphs (from NOAA in Boulder) show that April has been quite dry so far wrt precipitable water (PW). 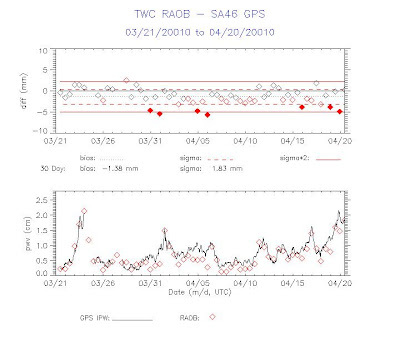 Note also that the TWC (Tucson) upper-air soundings have had a strong dry bias during the month relative to the GPS PW values - seven TWC soundings were dry relative to the GPS running mean by more than a standard deviation. This morning the two different measures were in agreement with around 2 cm of PW. The numerical forecasts at the end of last week (verifying at 5 pm MST this afternoon) had quite a spread of intensities and positions for the 500 mb S/W coming ashore today. The images above show the NAM 500 mb forecasts valid at 5 pm for 84-hours (top panel and also in post below) and for 12-hours bottom panel. The heights over southwestern AZ, northern Baja and extreme sourthern CA are 50 to 100 m higher in this morning's NAM forecast - and show the vorticity maxima tracking across northwestern AZ rather than northern Baja. The comparison of models for this event at 84 hours and beyond shows that the GFS operational member was the most accurate prediction, having the vorticity maxima only a bit too far north (see post below for the GFS forecast at 84-hours). The ECMWF was clearly too strong and too far south and thus was bested by the GFS - something that happened only a few times during the winter. So, we in southeast AZ can look forward to an afternoon and evening of winds, blowing pollen, and perhaps some dust. Last precipitation here at house was almost three weeks ago on the afternoon of March 23rd. The weather situation for next Monday (April 12th) continues to be quite interesting and the NWS models forecast considerably different solutions for Arizona at 84-hours. The GFS (top) forecasts (at 500 mb) a negatively-tilted S/W into northwestern Arizona, with a voticity maxima near Las Vegas. In contrast the NAM (bottom panel) forecast for the same time indicates a much sharper, and negatively-tilted, S/W to be over southern California and northern Baja, with a vorticity maxima over northern Baja. Note that 500 mb heghts are 50 to 100 m lower over southwestern Arizona, southern California, and northern Baja in the NAM forecast. Winds in both model's forecasts are strong at 850 and 700 mb but much more southerly in the NAM forecasts. The NAM hints at moisture inflow from the south, while the GFS is quite dry, with its southwesterly fetch from the Pacific. So, it looks like a windy start to the week no matter which forecast is more accurate, but the NAM solution would be much more interesting for southeastern Arizona with a stronger frontal passage and perhaps some showers and thunderstorms. The GFS and ECMWF model forecasts are still producing fairly different solutions for the 500 mb S/W trough or cutoff that comes into the west U.S. at the start of next week. Perhaps this uncertainty is due to the degree of downstream response in the forecasts to the intense cyclogenesis predicted to occur in the northwest Pacific and Bering Sea. The images above are the 48-hour forecasts (for the 00 UTC runs last evening) from the GFS operational member for the surface (top) and 500 mb (bottom). The very strong surface low in the Bering Sea appears to have a forecast central pressure of around 964 mb. The downstream response, ahead of the strong ridging that occurs across western Alaska, produces a significant vorticity streamer that feeds into the rather benign S/W off the northwest coast of the U.S. This flow also brings along an infusion of very cold air at middle levels. The result is a significant intensification of the eastern Pacific S/W after 48 hours. Currently the ECMWF brings this system ashore further south and with greater intensity than does the GFS. The model that best predicts the events off in the far northwest Pacific will probably also verify best over the western U.S. Something to watch the next couple of days. Our travel on Thursday April 1st (see post just below this one) took us into, and out of, two of my least favorite of the major airports in the continental U.S. - San Diego and Midway. The images above show the two airports and the congested neighborhoods that seem to come up right to the ends of the runways. The approach to San Diego is usually from the east and the nice view of Balboa Park changes suddenly, as the plane seems to scim the rooftops of houses as it approaches the runway - quite un-nerving. Note that San Diego has only one major runway so that cross winds can make the landings more tricky than at other major airports. Midway has more runway options but, regardless of the directions of approach, the final minutes of flights into there also seem to scim the roofs of peoples' homes. A strong middle and upper-level trough was crossing the Southwest when we flew to Chicago on April 1st. 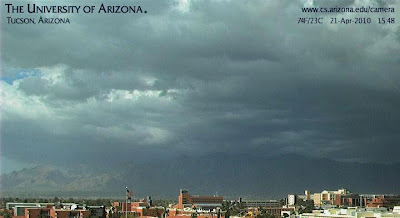 This system brought wind and dust to the Tucson area, but rainfall was mostly just sprinkles. We flew on Southwest and had an indirect route that took us to San Diego and then to Denver and finally to Chicago Midway airport. A long day of travel! 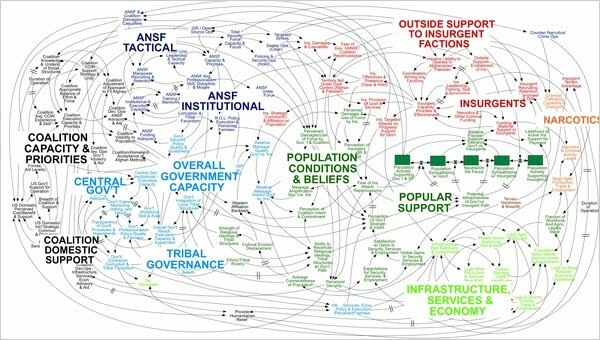 The chart above (from the Univ. of Wyoming upper-air site) is the 300 mb analysis for the morning we were flying. Note the 130 to 150 kt jet from Tucson across the Colorado Rocky Mountains. The flight encountered some of the worst turbulence I've experienced in my years of travel as it crossed central Colorado, and the light to moderate turbulence on approach to, and departure from, DIA seemed minor. The trough caught up with us in Chicago bringing rain and storms late Friday and Saturday morning and again on Easter evening. Rainfall on Easter evening, associated with strong low-level warm advection, was fairly substantial with amounts around a half to more than an inch. Windy? - of course! Return flight on Monday afternoon 5 April was back into the base of another strong middle and upper-level trough, as we had a connection in Las Vegas. the flight was choppy but nothing like that of the preceding Thursday. Winds had been very strong across the Southwest during the afternoon and the deep boundary layer was laden with dust. I noted that some surface stations in northern Arizona had reported wind gusts of 50 to more than 60 mph. No rain in the gauge on return home. Coldest morning low temperature while we were away was 24F, apparently on Friday April 2nd.